Clerkenwell Design Week is a three-day festival, which takes place annually in May for the last 5 years, celebrating the creativity, social relevance and advancements in technology behind design in Clerkenwell of central London-UK. Clerkenwell Design Week is a must to go showcase, if you are a member of the design community and want to enlighten yourself, get informed about the happenings and meet people and brands from the industry. More and more people are getting interested each year. Did you know in 2013 the event attracted around 54,000 enthusiasts? This year between 20-22 May, over 20 local bars and restaurants in the area took part in the showcase. So why Clerkenwell? Slowly but surely becoming one of the most important design hubs in the world, Clerkenwell has been home to more creative businesses and architects per square mile than anywhere else on the planet for the last years. The name comes from the Clerks’ Well in Farringdon Lane. Since the Industrial Revolution there were craft workshops, clock makers and jewelers, as well as graphic designers. The region housed central studio and workshop spaces in the last two decades. So, “design” has always been in the area. Clerkenwell, being UK’s most important generator of creativity and innovation, also has become home to new media agencies, graphic and interactive design studios and more than 200 architectural practices – and houses over 60 design showrooms including world leaders Vitra, Poltrona Frau, Knoll and Steelcase. Detail took place in the majestic Priory Church at the Order of St John, focusing on high-end interiors and decoration. In addition to the venue’s majestic Church, Crypt and Cloister garden, a new pop-up pavilion has been installed on St John’s Square. Key names such as Ochre, Ginger and Jagger, Munna and Tracy Kendall returned to the venue once again, while the likes of Christopher Jenner for Drummonds and St Judes made their debut at the show this year. Speaking of St John, we have to mention the modern Eastern ceramic installation: Tile Mile, located at 500 years old St. John’s Gate. Tile Mile is a tiled passageway by Turkishceramics and design studio russ + henshaw featuring parallel inward-facing mirrors that allow visitors to experience diminishing images of themselves that extend to infinity. The parallel mirrors reflect the vaulted ceiling of the arch, as well as the floor. 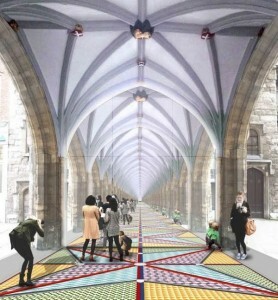 russ + henshaw used 7,200 ceramic tiles to create this colourful passageway beneath the medieval arch. Bahadir Kayan, Chairman of Turkishceramics, describes the installation as a creative representation of how modern Turkish ceramics products and historical architecture work together harmoniously since the Tile Mile Project was inspired by the columns, vaults and their reflection to the water of Basilica Cistern in Istanbul and influenced by Turkey’s traditional Iznik ceramics. The designers chose diamond-shaped tiles in ten colors – red, oil blue, yellow, sage green, dove grey, white, scarlet red, cobalt blue, sky blue and turquoise. It is no wonder that, this playful installation was appealing to most of the visitors. Alongside four central venues, a series of talks, seminars and workshops with leading industry specialists took place. CDW has consistently increased its influence and reach in the international architecture and design arena. Among 54,000 visitors in 2013 27% were architects and developers, 21% interior designers, 22% product designers and manufacturers, and 11% buyers and retailers. Growing year-on-year, 2013 saw over 250 design brands exhibit across a series of pop-up exhibitions and open showrooms from Erwan Bouroullec and Patricia Urquiola, to Giulio Cappellini and Ross Lovegrove. Over 35 countries were represented by exhibitors, while a 7% rise in international visitors (2012-2013) saw guests from over 100 countries attending the festival. Now established as one of the key international design festivals, CDW was awarded Best Festival and Best Cultural Event by the UK Event Awards in 2012, and Best Live Event by AEO Awards in 2013. This entry was posted in Home on 2014/06/13 by admin.